Many business audits occur randomly, but a variety of tax-return-related items are likely to raise red flags with the IRS and may lead to an audit. Here are a few examples: significant inconsistencies between previous years’ filings and your most current filing, gross profit margin or expenses markedly different from those of other businesses in your industry, and miscalculated or unusually high deductions. An owner-employee salary that’s inordinately higher or lower than those in similar companies in his or her location can also catch the IRS’s eye, especially if the business is structured as a corporation. 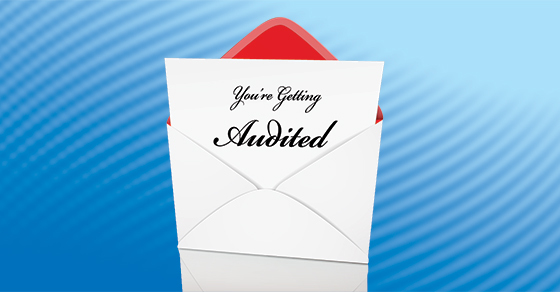 If you’re selected for an audit, you’ll be notified by letter. Generally, the IRS won’t make initial contact by phone. But if there’s no response to the letter, the agency may follow up with a call. The good news is that many audits simply request that you mail in documentation to support certain deductions you’ve taken. Others may ask you to take receipts and other documents to a local IRS office. Only the most severe version, the field audit, requires meeting with one or more IRS auditors. More good news: in no instance will the agency demand an immediate response. You’ll be informed of the discrepancies in question and given time to prepare. To do so, you’ll need to collect and organize all relevant income and expense records. If any records are missing, you’ll have to reconstruct the information as accurately as possible based on other documentation.